Staff from Broadland District Council, NPS Group and Norwich Fringe Project got hands on to create a woodland walk and animal shelter at the new Carrowbreck Meadow housing development in Hellesdon, Norwich. Volunteers took part in the conservation day to help lay a woodland path and construct a hibernaculum – an overwintering site for insects and reptiles. The work was led by the Norwich Fringe Project who will be managing the woodland after the housing development is completed. Designed by Hamson Barron Smith, Carrowbreck Meadow is a new development of 14 family homes in a mature woodland setting. The houses are built to Passivhaus standards – the international benchmark for excellence in energy efficient construction. 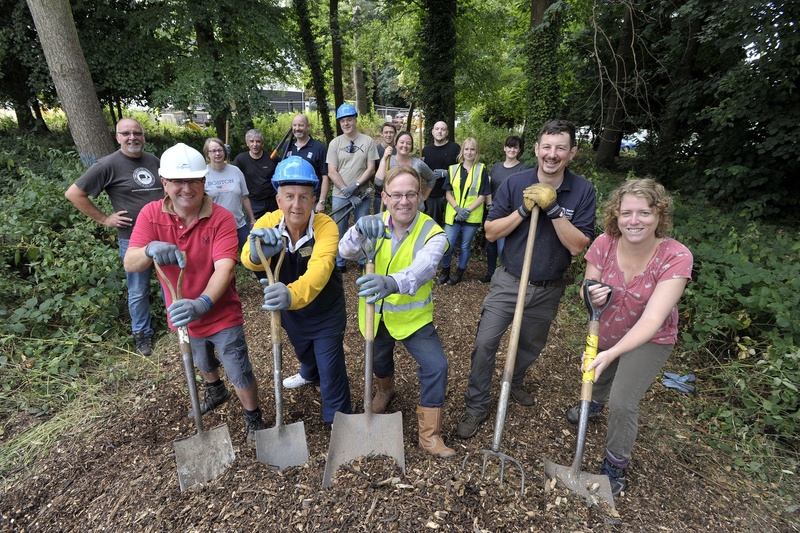 Matt Davies, Project Officer for the Norwich Fringe Project, said: “The volunteer work day was a great success – we were able to create a home for lizards and reptiles and lay a wood chip path through the woodland. Thanks also to Darrel Moore, a local tree surgeon, and Thorpe St Andrew Town Council for giving up their time and supplying the wood chips for free”.